Nature Physics today, Monday, 23 January 2017, published online the research by a team led by physicists from the School of Physics at Wits University. In their paper titled: Characterising quantum channels with non-separable states of classical light the researchers demonstrate the startling result that sometimes Nature cannot tell the difference between particular types of laser beams and quantum entangled photons. "Quantum" refers to the small, and in the photonics world this means one photon - a single particle of light. The rules of the quantum world are vastly different from that of the classical world, and experiments are traditionally much harder due to the difficulty in handling just a few photons. "In the classical world our intuition holds true. There are no surprises and experiments can be done with many photons (billions and billions of them), such as laser light," explains Professor Andrew Forbes, team leader of the collaboration and Distinguished Professor in the School of Physics where he heads up the Wits Structured Light Laboratory. "But not so in the quantum world, where things are never quite as they seem. Here waves sometimes look like particles, particles like waves, and measurements change the properties of the very thing you are trying to measure." Now researchers have shown that there is a grey area where Nature cannot tell the difference between the classical and the quantum. This opens the possibility of first performing quantum experiments with a type of classical light called "classically entangled" light. For example, establishing a secure quantum communication link over long distance is very challenging: "Quantum links (as in fibre optics) using patterns of light languish at short distances precisely because there is no way to protect the link against noise (interference from, for instance, fog or a bend in a cable) without detecting the photons. Yet, once they are detected their usefulness is destroyed," says Forbes. By preparing and sending a so-called "classically entangled" beam the team could show that this was identical to sending a quantum state. This means that the observed quantum entanglement decay due to noise in the link can be reversed, paving the way for major advances in secure quantum links in fibre and free-space. 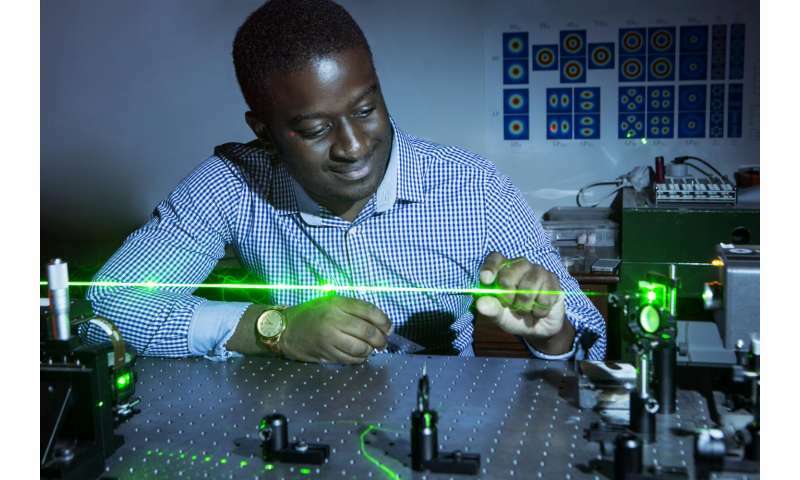 "We showed for the first time that classical light can be used to analyse a quantum link, acting as a direct equivalent to the behavior of the quantum state," says Bienvenu Ndagano, lead author and PhD student at Wits University. "Not similar, or mimicking, but equivalent. To show this, we exploited a particular type of laser beam, called vector beams, that have the property of being non-separable and sometimes called 'classically entangled'." Ndagano explains that the quintessential property of quantum entanglement is the non-separability of the state, meaning that one part of the system cannot be separated from the other. "But non-separability is not unique to the quantum world: you can find it in weather maps where the locations on the map and the temperatures at those locations can't be separated." More intriguingly, classical vector beams have this property too, which the team calls "classically entangled" light. Says Forbes, "What we asked was: does this mean that classical light can be used in quantum systems - a grey area between the two worlds that we call classical entanglement?". "The notion of classical entanglement is hotly contested in the physics community with some arguing that it is merely a mathematical construct," says Thomas Konrad (UKZN), co-author on the paper. "This work shows that there is physical meaning to it too, and we offer the first side-by-side data of the equivalence of classical and quantum entanglement". "By working in this grey area between the classical and the quantum we can show fast and secure data transfer over real-world links," says Forbes. Of course. In quantum mechanics anything is possible. Even poop can stick to the ceiling.